Carillion's board presided over a "rotten corporate culture" and was culpable for its "costly collapse", two committees of MPs have concluded. They also called for a potential break-up of the big four audit firms, after they "waved through" the indebted construction firm's accounts. And they attacked the government for lacking "decisiveness and bravery" to tackle corporate regulation failures. The MPs said regulators should consider disqualifying the directors. 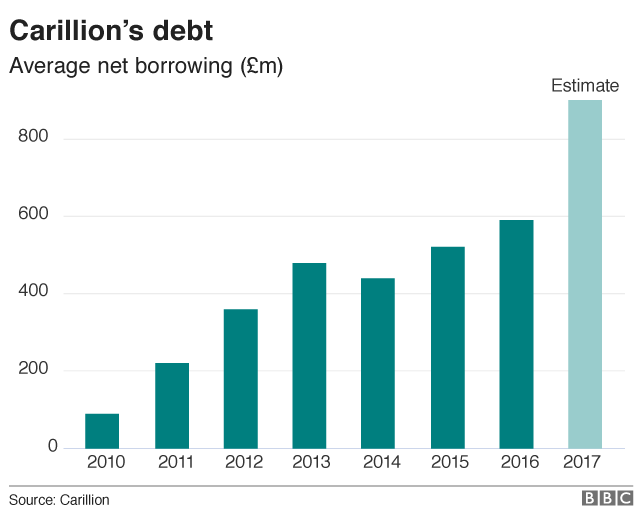 Carillion collapsed under a £1.5bn debt pile in January. It employed 43,000 people, about 20,000 of them in the UK, thousands of whom have lost their jobs. It also held numerous public contracts, such as the maintenance of schools and prisons, all of which had to be brought under government control, at a cost to the taxpayer. The Big Four accountancy firms were a "cosy club incapable of providing the degree of independent challenge needed"
Carillion's collapse had exposed "systemic flaws" in corporate Britain and showed regulators were "toothless"
And warned "Carillion could happen again, and soon"
Rachel Reeves, chair of the business committee, told BBC Radio 4's Today programme: "The directors are culpable for the mess that Carillion got into and drove the company off a cliff." She accused them of a "relentless dash for cash" by taking on low-margin contracts which didn't make money. "And when we had the directors in front of our Select Committee, they seemed to be in total denial about what happened to their company," she said. What are the directors accused of? In their report, the two committees called Carillion's rise and fall "a story of recklessness, hubris and greed". Where did Carillion's problems come from? They singled out former directors Richard Adam, Richard Howson and Philip Green for particular scrutiny, saying the men had grown the firm through ill-judged acquisitions while hiding Carillion's financial problems from shareholders. They added that even as the company publicly began to unravel, the board was "concerned with increasing and protecting generous executive bonuses". "Long term obligations, such as adequately funding Carillion's pension schemes, were treated with contempt," they said. They said the directors had presented themselves during parliamentary hearings as victims of "unforeseeable mishaps". But Carillion's former finance director, Richard Adam, said he rejected the committees' conclusions and objected to quotes in the MPs' report, which he said had been misattributed to him. Former chairman Philip Green said the board had "always strived to act in the interests of the company and all its stakeholders". What are the auditors accused of? The two select committees also attacked the big four accounting firms for approving Carillion's accounts despite its spiralling debts. They said Ernst & Young was paid £10.8m for "six months of failed turnaround advice"
Deloitte received £10m to be Carillion's internal auditor, but was either "unable or unwilling" to identify failings in financial controls, or "too readily ignored them"
KPMG failed to question Carillion's financial judgements while PwC continues "to gain" as its official receiver "without adequate scrutiny". But a KPMG spokesman said it had conducted its audits of Carillion "appropriately", and Ernst & Young said it was "disappointed that despite all efforts the business was not rescued". Deloitte said it was "disappointed" with committees' conclusions while PwC said it was helping save "thousands of jobs" as official receiver. Michael Izza, chief executive of the Institute of Chartered Accountants, told the Today programme the report felt like a watershed moment for the industry. "It gives us an opportunity to think again about what we need to do to fix this. Because if we don't fix this I don't think we're going to have a profession in 20 years time." What are regulators and the government accused of? The MPs also accused regulators of being too "passive" in tackling Carillion's problems, and said government failures had made the collapse of the outsourcing firm "if not inevitable, then at least a distinct possibility". But they said the government had failed to spot the risks because of its "semi-professional part-time" system of oversight. Frank Field, chair of the Work and Pensions Committee, said: "Government urgently needs to come to Parliament with radical reforms to our creaking system of corporate accountability." A Cabinet Office spokeswoman said it had recently announced measures to support government suppliers, including strengthening its commitment to "protecting staff, businesses and small suppliers from irresponsible directors". It said it would "respond fully" to the committees' report in due course.